Do you love the Anastasia Brow Wiz but need a more affordable alternative? I’ve searched high and low and found the best Anastasia Brow Wiz dupe you will love! I was perusing Ulta the other week with my bestie, Katie. We eat and makeup shop – that’s how we roll. I spotted the NYX Micro Brow Pencil, and it looked eerily similar to my holy grail eyebrow product, the Anastasia Brow Wiz . 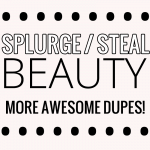 I’m all about a good dupe, and I love discovering new ones so I can share them with you. Despite the fact that I constantly keep two Anastasia Brow Wiz pencils in my possession at all times (I need a back up if one runs out! Hashtag makeup Armageddon…omgggggg), I had to try the NYX product out to see if I could find something that came remotely close and could call it my Anastasia Brow Wiz dupe. I have yet to find the perfect brow product at the drugstore, aside from the Milani Clear Brow Gel, so I was excited to try this! Now, let’s talk about the specifics. I think in order for this to be a good dupe, it should be a good color match, applies similarly, and performs as good as its high-end competitor. It’s identical. NYX really is paying homage to the Anastasia Brow Wiz here (or is that copying?). The only slight difference is the spoolie on the bottom is a little longer and thinner than the Anastasia Brow Wiz. They also open on opposite sides of the packaging logos. Maybe that makes it not an exact copy cat, so NYX can get away with it? The NYX Micro Brow Pencil comes in eight shades, which is very impressive, considering it’s a “drugstore” product. The Anastasia Brow Wiz comes in nine shades. I picked up the shade Taupe because I felt like there wasn’t anything similar (Ash Brown seemed like it would be too dark for me). Little did I know that Taupe would be an almost dead on dupe for Soft Brown! This may be disappointing, though, for people who are used to Anastasia’s Taupe. I would assume this is not a match at all. I can wear Taupe or Soft Brown in the Brow Wiz, but I think Soft Brown is a little bit of a better match. If that helps any. The Anastasia Brow Wiz is very easy to use. It glides on, is creamy, and looks very natural. The NYX Micro Brow Pencil is a little waxier. It takes me a lot longer to fill in my brows than it does with the Anastasia Brow Wiz, but I’m willing to forgive that because sometimes waxy can be better. It lends itself to looking more natural. The NYX pencil looks incredibly natural and is actually a lot more long-wearing than the Anastasia Brow Wiz. I swatched both on my hand when I got home, and it took a lot longer for the NYX one to rub off. I was impressed! I always set my brows with a clear brow gel, though, and I didn’t notice a huge difference when the NYX was applied on my brows versus when the Brow Wiz was. Now for a look at the product on my actual eyebrows. On my actual face. Let’s forget it was a “no makeup makeup” day here and forgive that I do need to groom them a bit. I just went in for a light filling so that I don’t look completely whack. The more that I look at this picture, the more I think the NYX is a better match for my brows. The Anastasia is looking a little warmer in this photo, to me. I will say – in person, you really cannot tell a difference. I’ve been walking around with eyebrows filled in by two different products and nobody has pointed out my grave mistake. Not that Greg or the two small children in my house would even notice or care, to begin with. But, that’s beside the point. Yes, the NYX Micro Brow Pencil is a dang good dupe for the Anastasia Brow Wiz! I will probably have both in my collection, because I do love both products (and, lezbehonest, I hoard makeup)! If you’ve been wanting to try the Anastasia Brow Wiz, but can’t justify $21 for a brow pencil, definitely go out and grab the NYX Micro Brow Pencil, the true Brow Wiz dupe, IMO. I haven’t seen it anywhere but Ulta. Also, Ulta always sends out 20% off coupons, so make sure to use one on this! If you love this post, check out other posts where I’ve featured the Anastasia Brow Wiz! Empties! Makeup & Skincare I’ve Used Up – Would I Purchase Again? Or browse all of my makeup blog posts HERE! Oh I am so excited about this! Thank you for finding a dupe!!! That sounds and looks like a great dupe Meg! I’ve wanted to get a brow pencil… but… don’t laugh… I can’t fill in my eyebrows to look natural. They look ridiculous when I fill them in. Maybe you can do a tutorial (or maybe you’ve done one already)?! this is amazing. My wallet …. and hubby thank you! I find NYX Brow Cake in Taupe/Ash absolutely amazing. Gorgeous, natural color, and lasts all day for just $6. It isn’t a pencil, but to me it is so much better for creating a natural look. Good to know!! I am definitely going to check it out! Hello Meg. Thank you for the input on drugstore versions that do as well or better than the specialty brands. I’m 60 years young and live alone on a tight budget. I love this blog! Thanks so much for the recommendation it worked amazingly as an inexpensive dupe!!!! I’m new to your site and just noticed this great blog. I love NYX! So amazing. Have you ever tried the e.l.f. clear brow and lash gel? I really like it and for $2 can’t beat a versatile product! This is great! Thanks for sharing. I’ve been using ABV Brow Wiz and ABV Dipbrow, but I’ve been looking for a cheaper alternative. I’ve had good luck with NYX products, so I think i’ll try this one out! Yay! Glad to help – hope you enjoy it! !